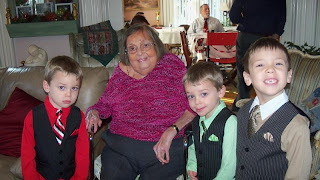 Monday afternoon we got word that my Grama's sister, my Great Aunt Lo was not doing well. My Mom and I made plans to visit her in Westerly the next afternoon, right after Ana's wedding. Instead we woke up to the news Valentine's morning that she had passed away that night. It was so hard telling the boys. They absolutely loved getting to visit her from time to time at the nursing home. This is the last photo I have of them from Terranova Christmas. Rest in peace Auntie Lo. The boys and I will miss you.